Take 1 capsule daily with food any time of day or as directed by your healthcare professional. 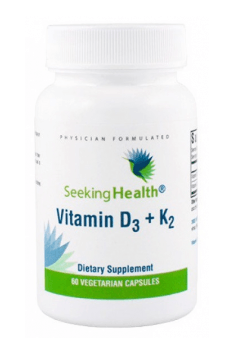 Studies unambiguously indicate that simultaneous supplementation with vitamin K2 and D3 results in higher mineral density of bones than supplementation with only vitamin D3. Vitamin D3 and K2 belong to vitamins soluble in fats. Therefore, in order to ensure optimal assimilability of the preparation, the recommended dose should be taken with a meal containing fat. In case of the simultaneous supplementation with vitamin D3 and K2, one should remember about proper ratio of these vitamins to ensure proper bone mineralization – at least 100 mcg of vitamin K2 per each 5000 IU of vitamin D3. The producer took care of this ratio in the preparation.